You might think there couldn't possibly be any no sew projects when making historical costumes, but I've dug up a few, and they might be saviours for a anyone starting out in re-enactment! Another project that just involves cutting your fabric, is Wickelbander, or leg wrappings, used to bind the lower legs of hose or breeches, and sometimes taking the place of socks. These were used by the Celts, Saxons, and right into the 12th Century. You'll even have fabric left over to make some for your friends! If metal work or hammers are more your thing, perhaps you could consider making yourself a leather belt with a period buckle. Need something smaller and even simpler? 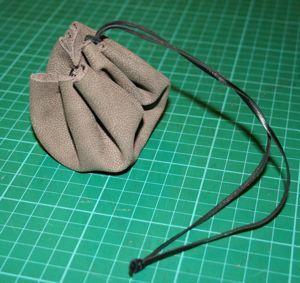 Learn some basic leatherwork, and make a <a href="http://www.homemade-costumes-from-history.com/simple-pouch.html"><font color=#CC6633><u>Simple Pouch</u></font></a> from a Viking find. Then, try making some simple leather garters! There are also a great many designs for belts which call for a woven piece of braid in place of the leather. This project (as well as trimmings for your Viking, Saxon and later Medieval and Renaissance garments) can be done using the techniques of Tablet Weaving, or Inkle Weaving. Fingerloop braiding is incredibly useful for making short to medium lengths of cord for use in pouches, or as laces and points. Need something longer? Lucet braiding will produce a cord of almost any length you need, depending on how long your piece of "string" is! Do you know how to knit? Perhaps you could try knitting an Elizabethan flat cap like the example found on the Mary Rose… or some silk stockings! Go back even further in time, and you could learn how to do Nalbinding, an early form of "knitting", using one large needle, that can be used to make anything from beautiful caps and hats, to socks, stockings and mittens. And even more no sew projects! We're going to add to this page as time goes on. If we haven't added an article for something we've mentioned yet, you can always have a search around on Google - there are tons of useful resources out there! Make a Simple Pouch Based on the Hedeby Viking finds. Make Leather Medieval Garters and other styles. Some Viking Cloaks don't need sewing!